The summer is a time to dream and finish up those graduation parties. My wife and I try to go to all the graduation parties in our church, or that are invited to, if we are in town. Graduation is a time of year when fear and uncertainty plague many people. School officials and parents are afraid that the graduates will party too much or be hit by a drunk driver. Graduates are uncertain about their future and if they will get a job or not. Churches know that when the kids leave for college, most of them will not become a part of a church somewhere else. There is a lot of apprehension. Please continue to pray for the graduates and this time of the year. The African impala can jump to a height of over 10 feet and cover a distance of greater than 30 feet in just one jump. Yet these magnificent creatures can be kept in an enclosure in any zoo with a 3-foot wall. The animals will not jump if they cannot see where their feet will fall. Graduates and other dreamers, I want to encourage you to break free from the prison of fear. “Be all that you can be.” “Just do it.” When fear starts to keep you from making giant leaps, then use a little faith and go for it. You have so much potential. Don’t let three feet of doubt or fear keep you from accomplishing your dreams. Even though this might be a worry filled season for you, take those worries and turn them into possibilities. Faith is the ability to trust what we cannot see, and with faith we are freed from the flimsy enclosures of life that only fear allows to entrap us. Hebrews 11:1,6 reads – “Now faith is being sure of what we hope for and certain of what we do not see. And without faith it is impossible to please God…” Faith is used many times in ordinary ways: “I have faith in you” or “have a little more faith” or “faith your way through.” Using the word faith with things that you can see and figure out on your own, is really a misuse of the biblical word. Faith means to put your trust in something you can’t see or explain. It’s just the opposite of the impala, that won’t jump if it can’t see. Let’s pray that our graduates will put their lives into the arms of God. Go ahead and jump. 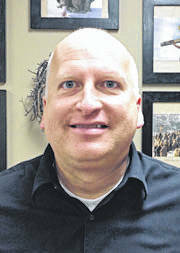 Dr. Andy Spencer is the Senior Minister of First Church of Christ on Ledbetter Road in Xenia.